On Sunday 15th March 2015 over 90 children involved in various local support services came together to enjoy a day of workshops and activities at 'Butterfly Wishes'. 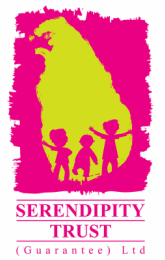 Butterfly Wishes, a special Galle Children's Festival outreach event for children with disabilities, was proudly presented by the Serendipity Trust in partnership with Equality-Based Community Support and Training (ECSAT). As children arrived they added their wish to the tree of butterflies before enjoying a range of arts, crafts, music, drama and story telling sessions. Huge thanks to the many volunteers who came together and worked tirelessly to make this day a success. The day ended with a Story Telling Session followed by group parachute activities and ice creams!